Ever feel like you are talking to a wall when you are trying to connect with your kids? I hear ya! This summer has been especially crazy for me and I feel like everyone has a different agenda and we are all living in the same house but doing separate things. Last night after dinner my kids were all on a different ‘device’ even though we were all in the same room! Something felt very wrong. My husband said he didn’t like it and told everyone they needed to do something together and put devices away. It’s hard in the world we live in now to put all the distractions away and find time to actually CONNECT with our families but it is so absolutely essential!! Even when life is crazy, I have found that there are 3 great times each day when I can get my kid’s undivided attention and connect with them. 1. Meal time! We all have to eat and the best time to get kids to listen is when their mouths are full of food. I learned this from my mom when I was little. During breakfast every morning she would put a very large book of scriptures stories on the middle of the table that had an audio cassette she played with it. We had no choice but to hear those stories every morning as we ate our breakfast. My mother was wise. She knew how important it was for us to start our day right and I’m grateful to her for it. But seriously…if you feed them, they will come, and if the mouth is busy the ears are listening! 2. In the car! I love music, especially while driving! I am learning lately though, that this is the perfect time to talk to my kids. This is especially true for my 11 yr old daughter who is just at that age where she loves to talk….a ton! When my kids are buckled in, they have no choice but to be my undivided audience! So, I can either pump up the volume or turn it down and connect. I’m not saying a groovy tune isn’t fun and helpful for connecting with kids, but the tendency to fill the ‘quiet spaces’ with noise can rob me of precious moments. I’m trying to be better at that! My BIG talker! Love that girl! 3. Right before bed! If you be read my post on getting kids to fall asleep you know how I feel about this one. There is just SOMETHING about that time right before bed that makes a kid want to connect. I don’t care how old they are! When I was a teenager my mom would always wait up for me to get home and I loved those late night talks. I still remember having some up till the day I was married! Sometimes it only takes a few minutes. What is a few minutes compared to the rest of a day, week, or a lifetime? Days seem long especially with my little kids and it’s so tempting to just GET THEM TO BED because I am so tired! The nights I don’t connect, though, are ones I regret. No matter what is on my to do list or how tired I am, NOTHING is more important as a mother than the opportunities that come to teach a child. I only hope that even though I have missed plenty of opportunities that when they are grown I will have done enough. I don’t even want to think about that day! I wish my kids could stay young forever (well, NOW I do. 3 hours ago I wanted to ship them off to a deserted island!) but, unfortunately I keep feeding them and they just keep on a growing! Wow. How blessed am I to be the mother of such great kids! Now, if you’ll excuse me I need to get some sleep. Morning comes quickly and they might not seem so ‘great’ anymore when they wake up! 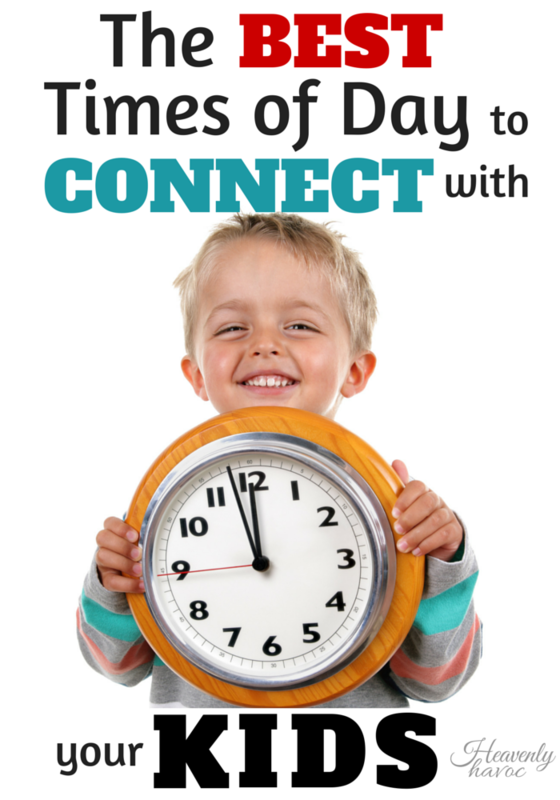 In this crazy world that we live in, how have you found time to connect with your kids? Please share! I would love to hear!